This pioneering volume is devoted to the analysis of education from the perspective of political science, applying the full range of the discipline’s analytical perspectives and methodological tools. The contributions demonstrate how education policy can be explored systematically from a variety of political science perspectives: comparative politics, public policy analysis and public administration, international relations, and political theory. By applying a governance perspective on education policy, the authors explore the changing institutional settings, new actors’ constellations, horizontal modes of interaction and public-private regulatory mechanisms with respect to the role of the state in this policy field. The volume deals with questions that are not merely concerned with the content or outcomes of education, but it explicitly takes a political science view on how education politics work. 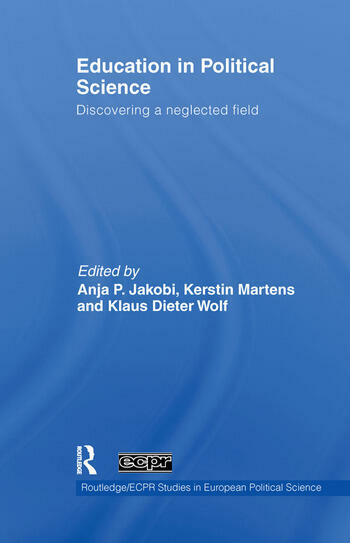 Including country case studies from the Americas and across Europe, institutional analyses of education policy in the EU and the WTO/GATS as well as normative reflections on the topic, the volume provides a grand overview on the diversity of issues in education policy. Dealing with a so far neglected field of policy, this book provides a comprehensive and accessible analysis of a rapidly changing topic. Education in Political Science will be of interest to scholars and students of political science, education, sociology and economics. Anja P. Jakobi is a Senior Researcher at the University of Bremen, Germany. Kerstin Martens is an Assistant Professor of International Relations at the University of Bremen, Germany. Klaus Dieter Wolf is a Professor of Political Science, Darmstadt University of Technology, Germany.